Sandfall is a collaboration between Lidia and Sherif, both leading musicians in the Middle East. 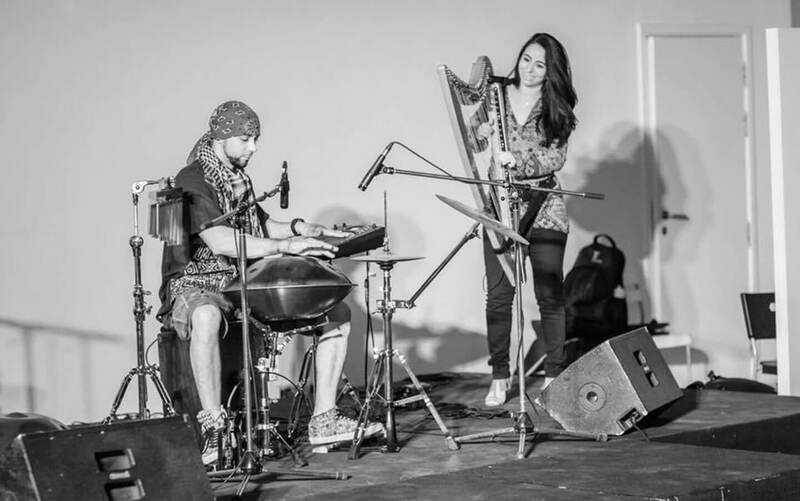 Together, they have created a magical union between one of the oldest instruments – the harp, and one of the newest magical creation from steel – the handpan. It was a few years back that Lidia heard the magical voice of the handpan. She felt it would complement the Harp and even gave it a name, ‘HarpPan’. If you close your eyes and listen, you would never recognize which note is played by the harp and which one by the handpan. But, it was one bright, sunny day in Dubai (like most days), there was a TV show shooting at the Fridge, and Sherif, was introducing the handpan to the Arab world for the first time. Lidia, on the other hand, was there with her new Canella project – electric harp and flute. It was then, that the possibility of having a duo with handpan started shaping up. Few months later, the opportunity arose, and Sandfall was born. The sounds of those two instruments with the other hundreds of small “gingelly” stuff Sherif uses, blend and make magic in front of your eyes. Sandfall creates mesmerizing music that gives you the most harmonious & peaceful atmosphere, and also more uplifting and energizing tunes when the setting demands. Know more about Sherif-El-Moghazy here. © 2018 Lidia Harp. All rights reserved.